The Jumpshare Blog - Page 4 of 11 - Re-imagining the way people upload, share and interact with their files. When you have too many collections, some of your more important ones tend to get lost in the stream. In order to help you quickly access your important collections, we’re launching “Favorities”. Open any collection and click the Star icon next to the collection name in the header. Once you’ve marked a collection as favorite, just head back to the My Uploads dashboard and click the “Favorites” tab to view that collection. We hope this little feature will help you become more productive. You can click the Favorites tab to view the collections you’ve favorited and not worry about losing them in all the other collections. With “Favorites” you no longer have to be afraid of losing important collections in your stream. For existing users who have desktop apps installed and for Jumpshare Plus users who use the Inbox feature, by default, we’re marking both “Desktop Uploads” and “Inbox” collections as favorite. This will help you quickly access them from the Favorites tab. We continue to make changes behind the scenes to improve your file sharing experience. 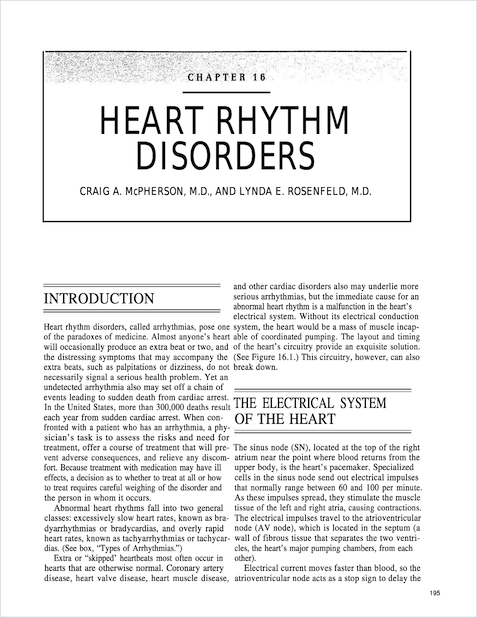 Starting today, you will see previews of spreadsheet, code, note, markdown, eBook, font, and CAD file in the thumbnails. You could already preview these files in our file viewer, but getting a glimpse of the content by looking at the thumbnails will help you navigate better. A big thank you to all those who’ve sent us their feedback over the past couple of weeks for Jumpshare 3.0. It was a big update and you had a lot to say. In response to your feedback, we’ve made several changes to the Jumpshare web app in order to give you a better sharing experience. There is no action our users perform more than uploading. Every day thousands of users upload tens of thousands of files with the intent of sharing them quickly. So we’re returning ‘Upload’ back to center stage. You can now upload your files straight from the dashboard with a click of the button. All files uploaded from the dashboard go inside a newly created collection, which is automatically named based on the number and type of files you upload (can be renamed later). You can still create a fresh new collection by clicking the drop down arrow next to the Upload button and selecting ‘New Collection’ option. Now you get a sneak peak of the files inside each collection by looking at their thumbnails. We’re showing 6 thumbnails for each collection. We’re also showing 4 thumbnails for folders inside collections. 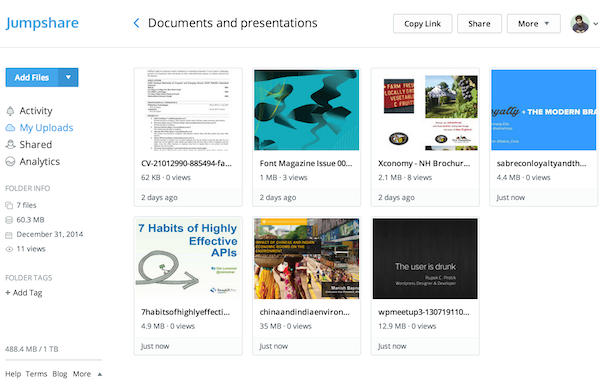 We believe by allowing users to quickly glance at the files inside each collection and folder, they will be able to navigate faster, share faster, and be more productive as a result. Jumpshare Plus users can receive files from anyone by sharing their unique Inbox link. We’ve made three changes to Inbox. First, we’ve redesigned the entire Inbox page so it’s easier for others to send you files. Second, you can now add custom branding to show your logo on Inbox page. Third, all files received via Inbox now go inside the collection of the same name, where the files are neatly organized by sender name. If you visit the Shared page, you will notice that you can now remove any sharing activity. We’re making the option to remove any sharing activity available to all users. With this option, you can remove shared files that recipients have deleted from their end or any activity that you do not want to keep permanently. The team is hard at work to release more updates. You will soon have the option for “List” view inside each collection, you will also be able to “Star” your important collections. Last but not least, you will be able to invite others to your collection for collaboration. We hope you like this update. If you have any features you would like to see or have any feedback, just shoot us an email and you will hear back from us shortly. 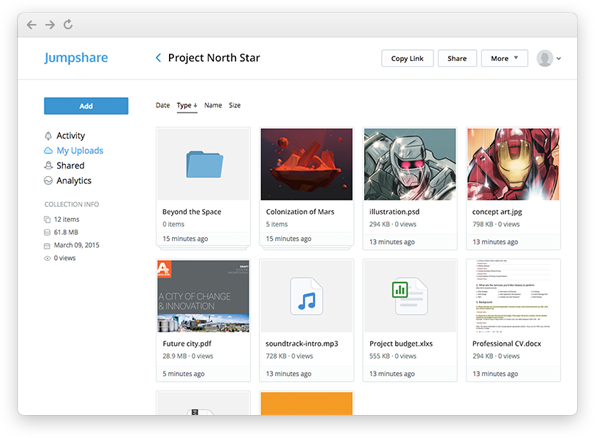 Today we’re announcing Jumpshare 3.0; a version that fights the clutter on your dashboard and improves file management. We’re introducing both collections and nested folders which will have a significant impact on how you organize your files. A collection is a group of files and folders that you can share with anyone. Use collections to organize your work by clients, projects, events, etc. Inside each collection, you can upload an unlimited number of files, links, and folders. When you first login to your dashboard, you will see a default collection called “Previous Uploads”. This collection contains all files you uploaded prior to Jumpshare 3.0. 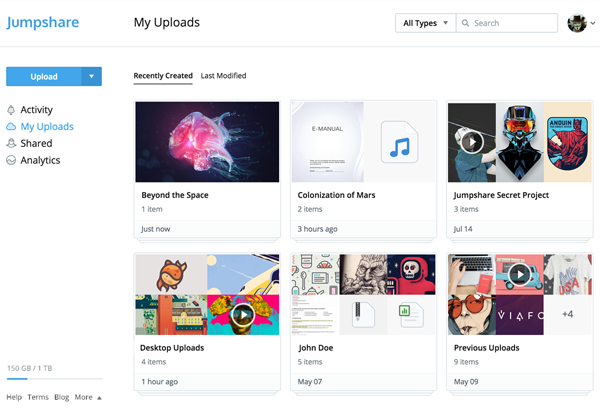 When you upload files using the desktop apps, they will get added to “Desktop Uploads” which is another collection that is created automatically. We recommend that you create a few collections to organize your projects. Collections can be sorted by “Recently Created” or “Last Modified”. By default, all collections are sorted by “Recently Created”. To create a new collection, click the “New” button on the sidebar. You can upload an unlimited number of files, folders, and links to a collection. We now support folder hierarchy; if you upload a folder (containing sub-folders) we will keep the directory structure intact. You can sort items inside a collection by type, date, name, or size. The default sorting applied to files and folders inside a newly created collection is “type”. You can share your collections as easily as you can share the files and folders inside a collection. 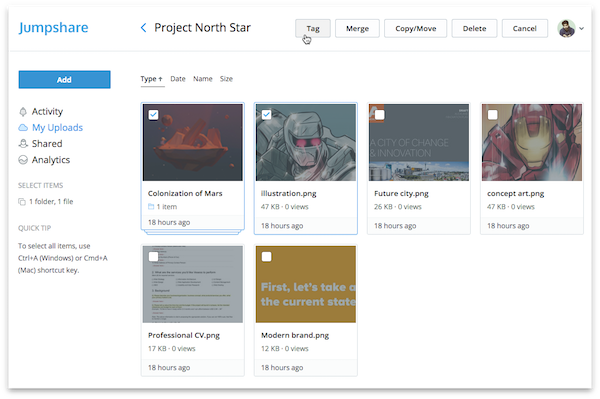 In the quest to make file management better, we wanted to ensure the “quick sharing” aspect was not lost. Tagging still remains the best way to find files quickly by power users and with Jumpshare 3.0, we now allow users to tag both files and folders inside a collection (previously tagging was restricted to folders only). Because we’re now supporting nested folders, we’ve removed nested tags because they would have become redundant in the large scheme of things. All nested tags will be attached to their parent tags. We’ve also removed the 3 tags per item limitation; now you can apply an unlimited number of tags to any item. Similarly, you can now merge both files and folders into a single folder so long as they are in the same collection or in the same folder. Previously merging was limited to folders only. Starting today, a collection and all items inside it (folders, files, and links) will have it’s own individual lock and self-destruct options. Previously, you could only lock a folder and if you applied a lock, it applied it to all individual files inside that folder which made it hard to share certain files (which you don’t want locked). But now you can choose which folder and file to lock and then share it securely. A locked item will show a lock indicator, which means the recipient will have to enter a password to access it. Similarly, you can now set any individual item to self-destruct. If you choose to self-destruct a collection or a folder, then all items inside it will also self-destruct. We’ve optimized our multi-part uploading to speed up the process. When you upload a large file, we break it down into multiple parts to speed up the uploading, and when finished, we merge these parts back together. If merging parts of a 200MB file took 60 seconds before, it now takes only 1 second in Jumpshare 3.0. That’s a whooping 6000% increase in speed. The thumbnails now show modified date instead of date of creation. The thumbs also show the actual dates for items older than “Yesterday”. Which means instead of showing the relative age of a file as “2 months ago”, we now show “Mar 16”. In our file viewer, you will now see a blue outline around the selected file thumbnail at the bottom panel. Hovering over these thumbs will show you the file name in a tooltip. When moving between pages, you will now see a progress bar above the header that indicates how much the page has loaded. Thumbnails now show the preview of the first file inside a collection or a folder. You can sort or rearrange your files to make a certain image show up first so it appears in the thumbnail. Deleting a collection requires you to check additional checkboxes to prevent accidental deletions. Newly uploaded videos will now play at 480p quality, up from 360p. A new navigation menu shows when you click the “<” button from a 2nd level folder and onwards. And a ton of other enhancements made on both the front-end and back-end. All files (including screenshots) uploaded from the Jumpshare desktop apps now go in the “Desktop Uploads” collection. Single files are no longer added to a new folder every time you upload them, thus preventing clutter and keeping things more organized. On both the Mac and Windows apps, we show 5 recently modified items from all collections. So if you upload/modify any file inside any collection on the web, it will show up in the desktop app, thus you can access and share it easily again from the comfort of your desktop without having to visit the website. The next step is to allow you to invite others to your collection for direct collaboration. We’re also working on a list view to make browsing your files faster. Our brand new OS X app is in the final stages of development and will launch soon, followed by an iPhone app which is also under development. We’re also working on an API to allow third party developers to build apps and integrate Jumpshare in their products. If you would like to test our upcoming features and apps before we make them public, you can join our beta testers list here. 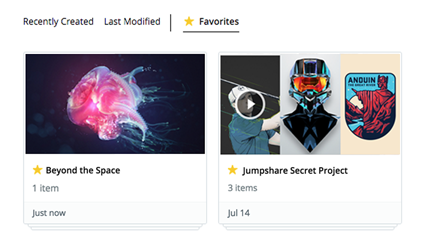 We recommend that you create a few collections to get started with Jumpshare 3.0. We’ve put a lot of effort into this release after hearing your feedback. We hope you like it. If you have any questions or feedback, shoot us an email at hello@jumpshare.com and we’ll be happy to help. 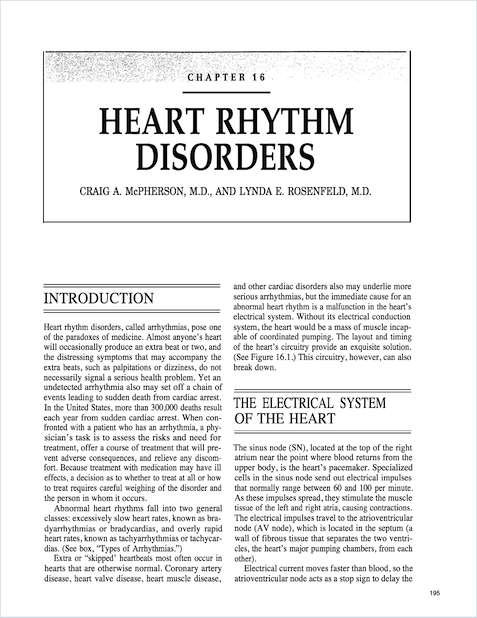 In a series of updates over the past days we’ve added support for markup (which was a long time coming), improved our file conversion speed, improved document output and started showing document previews in thumbs (for better navigation). Today we’re pushing an improvement to the output of both photoshop and vector images, making our output the best in industry. The improvements were made to the following formats; PSD, AI, and EPS. Below you can see the before and after comparison. We also compared the output on various file sharing services by uploading a sample PSD to find out which one generates the best output (both in quality and colors). You will notice that big players in the industry fail to generate correct colors in their output. 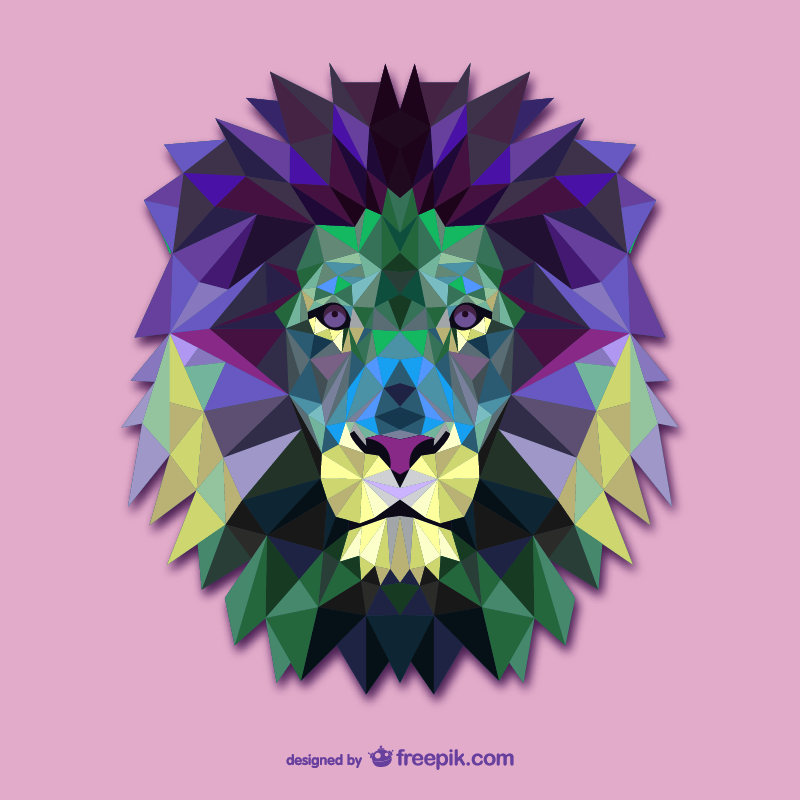 When designers want to share their files, they want to ensure the colors come out looking the same on both sides. With this update, designers have yet another reason to share their work using Jumpshare. 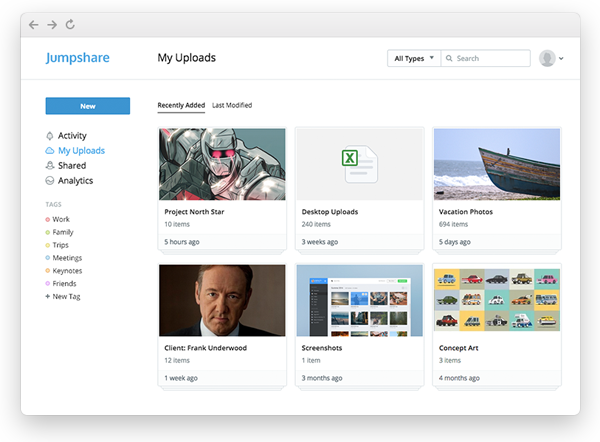 As part of our vision to turn Jumpshare into a platform for sharing everything, we’ve added the ability to embed content from third party sites when you use the upload link feature. When you upload a URL, we will automatically embed the content in the viewer, ready to be shared. At present, we’re supporting 10 content providers you use almost everyday; YouTube, Vimeo, Instagram, Vine, Slideshare, Scribd, Dailymotion, Soundcloud, SpeakerDeck, and Kickstarter. The advantage of sharing content using Jumpshare is that you can add your own logo, analyze detailed statistics about your audience, set the content link to expire after certain number of views, and more. The feature comes into play whenever you use the ‘Upload Link’ option from the Upload drop-down button. Likewise, upload a link from one of these ten services using the Windows or Mac desktop app, and the content will be embedded automatically when upload is complete. This new update makes the Upload Link feature smarter and gives users a better way to share content from the leading content hosting sites. We’re looking forward to our users trying it and hearing how they like it. Let us know which content providers you would like to see support for in the future. At Jumpshare, we pride ourselves on being able to preview the most file formats online but it isn’t enough to just open and display contents of a file. The quality of the file viewer is important and it’s a challenge for us particularly when it comes to previewing proprietary file formats like PDF, DOC / DOCX (MS Word) and PPT / PPTX (MS Powerpoint). Today, we’re proud to announce fresh improvement made to our conversion engine which will allow users to view files in better quality. Check out document output comparison below. The improvements are most noticeable for fonts, formatting, and image quality within documents. Apart from better output, you will now see previews of documents and presentations (PDF, MS Office and Open Office) on a file’s thumbnail making it easier to browse. We automatically reconvert your older docs when you open them again. Improving output is a gradual process and we hope to improve it further in the coming months. Our powerful conversion engine will soon be made available to developers who want to integrate the file viewer on their websites, mobile apps, or anywhere else. We’ve made plenty of changes under the hood. If you come across a bad output, send it over to hello@jumpshare.com and we’ll have a look. Did you see improvement of your document output? Let us know in the comments! Last month we released the brand new mobile version of the Jumpshare website. Today we’re adding the ability for users to upload their files on the go. 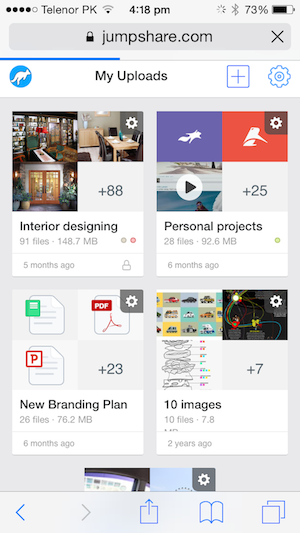 You can upload, manage, share, and preview your files right from the mobile website. To upload your files, simply tap the plus button in the top right corner of the screen. It will take you directly to your camera roll from where you can select photos and videos to upload. It works similar to the web. If you tap the plus button on the My Uploads page, it will create a new folder. If you tap the plus button inside a folder, it will add files to the existing collection. We hope this small but useful update will help our users share files better. Note: Make sure your Phone’s operating system is updated to the latest version. Most outdated browsers and OS do not support uploading from mobile website. There are many instances where you want to replace a file with a newer version while ensuring that the link you previously shared to it does not break. Suppose you want to share your work with a client and after receiving feedback, you need to share an updated version of the work again. Instead of sending your client multiple links, you can now simply replace an existing file with a newer version (as many times as you want) and ask your client to check it out at the same link. Or suppose you tweeted a link to a document and realized that you uploaded and shared the wrong file, or an earlier version of it. Instead of deleting your tweet and posting a new one, you can simply upload a newer version of your document and the old link will automatically direct to it. Nuclear Armageddon prevented! Starting today, when you upload the same file twice in a folder, we will show a pop-up box giving you a choice between replacing an existing file in your account with the newer version, or creating a duplicate file. You can also choose to Skip the file. If multiple similar files are detected, you’re given a choice to perform a single action on all of them in one go. If you choose to replace the file. We will simply replace the file with the newer version and you don’t have to worry about broken links.